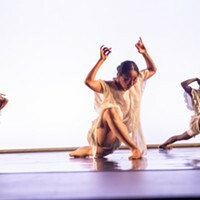 Last in Pittsburgh in 2011, New York City-based Stephen Petronio Company returns to the Byham Theater on May 7 with a program featuring local connections. The first of the program’s two works is famed choreographer Merce Cunningham’s “RainForest” (1968), as revived by SPC artistic director/choreographer Stephen Petronio. “[I]t is an iconic one in my mind,” says Petronio, by phone from Philadelphia. The 18-minute work, which will close the May 7 Pittsburgh Dance Council program, is set to composer David Tudor’s sound score of the same name, to be performed live. It is the first in Petronio’s BLOODLINES initiative, honoring a lineage of American postmodern masters. The program’s other work, Petronio’s 50-minute Locomotor/Non Locomotor (2015), is set to original music by Petronio’s cousin Michael Volpe (a.k.a. 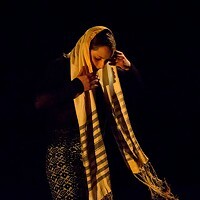 Clams Casino) and will be performed by eight dancers including 2012 Point Park graduate Tess Montoya. Its first part, “Locomotor,” is a retrospective of sorts, says Petronio.